Grand Theft Auto 5: we've tested and benchmarked the title on every single-chip enthusiast-level graphics card on the market right now. It's been quite the undertaking, but with the game notching up stratospheric sales in the last couple of weeks, we thought it would be worth it. Rockstar has created a highly scalable remaster - in our tests, a modest PC equipped with an £80 graphics card can trade blows with the PlayStation 4, while at the other extreme, engaging max settings can even cause problems for the £900 Titan X - but it's important to stress that while the GPU is one of the most important aspects of your gaming PC, recent games have pushed the importance of the CPU to the forefront - and GTA 5 is no exception. In this hardware guide, we'll be taking a look taking a look at Grand Theft Auto 5 performance across a range of processors and graphics cards, identifying what you need to hit solid performance levels. As usual, we've benchmarked using Nvidia's FCAT - a procedure that doesn't just give you basic frame-rate metrics but also visualises performance in context on a per-frame level, allowing us to identify problem areas in the game and from there we can tweak settings accordingly to ensure smooth performance. All of this testing is included in video format in this article. On top of that, we use the accumulated benchmark data to go one step further, providing recommended settings for each hardware performance tier, the idea being to hit a consistent 60fps with the highest level of visual fidelity possible. In our opinion, doubling frame-rate over the console versions of the game is the biggest improvement you can make - and the brilliant news is that you don't need to break the bank to achieve it. Don't let nostalgia do real damage. Graphics cards may well be the focus of this piece but the choice of CPU is also crucial in getting a good experience. To get an idea of what's required to hit an ideal performance level, we tested four Intel processors - the Core i3 4130, Core i5 4670K, Core i7 4790K and the frankly insane octo-core i7 5960X. The dual core chip works well if you're happy with 30-40fps frame-rates on console-level settings, but you'll need the i5 to stand any hope of hitting the preferred 60fps standard. GTA 5 scales over eight cores and 16 threads, and while you won't see any gargantuan improvement over an i5 in terms of frame-rates, curiously we see more stable frame-times the more cores you throw at the game. In our test below, we examine relative performance with GTA 5 running at 1080p on max settings (both standard and advanced fully ramped up), albeit with multi-sampling anti-aliasing (MSAA) disabled. We're using the Titan X - the most powerful single-chip GPU on the planet - in an effort to remove graphics as a potential bottleneck, and to put the CPU first as the sticking point in the system. It's worth pointing out that you can achieve higher frame-rates on the less capable chips by scaling back settings, but even then you're still going to need a Core i5 or better if you are intent on hitting consistent 60fps gameplay. Unfortunately, we weren't able to test any AMD processors, but data from Russia's GameGPU suggests that Intel beats off the competition in all areas - almost certainly down to Direct X 11's preference for a strong single core to drive the others. In terms of system RAM, Grand Theft Auto 5 consumes around 6GB in total, meaning that 8GB of DDR3 should be the minimum for running the title effectively. For an experience that matches what PlayStation 4 has to offer, we recommend a Core i3 4130 as a minimum, paired with Nvidia's GTX 750 Ti graphics card. Funnily enough, this is the same system we recommend as a good, all-round budget gaming PC. That's our baseline for this article - but it is worth pointing out that the game is playable on lower-end hardware, assuming you're happy with a more pared back experience. Remember, GTA 5 began life as an Xbox 360 and PS3 game - those lower quality assets are still there if you need them. There's a simple rule of thumb here - if you're happy with a 30fps experience on console settings, a Core i3 4130 or AMD FX-6300 should serve you well. If you're looking to hit 60fps, you need to aim higher and go for an Intel quad-core chip. When we compare PC games to their console equivalents, our first order of business is usually to utilise the PC options menu to replicate the console experience. Why? Well, developers look to extract the maximum visual impact from limited console GPU resources - the best bang for your buck, if you will. By matching console visuals, the compromises developers have chosen usually translate very nicely onto more modest PC hardware, while providing an excellent basis on which to scale up using more capable components. From there, the choice is yours. Do you go for increased visual effects, improved resolution, better anti-aliasing or higher frame-rates? Our recommendation in all cases is to kick off with these settings, then scale up to suit your tastes... and your hardware. GTA 5's benchmarking tool gives both CPU and GPU a thorough workout and should serve you well in tweaking your set-up to perfection. Keep a look out for the minimum frame-rate - it's usually found in the last sequence, which is especially heavy on the CPU. Finalise your tweaks by travelling north into the Vinewood Hills, where the grass setting may well need tweaking in order keep frame-rates consistently high. Click on the links above to buy these CPUs from Amazon with free shipping. AMD's Radeon R7 260X and Nvidia's GTX 750 Ti are the graphics cards we recommend for PC players looking to match the kind of rendering performance offered by the PlayStation 4 and Xbox One. Cheap but capable, the only disadvantage these cards have is a 2GB limitation on VRAM - to match current-gen console we recommend 3GB or more. However, at the £80-£100 price-point, 2GB remains fairly generous and with GTA 5 configured to our best abilities to match PS4 settings, both cards get the job done. Utilising very high quality textures takes us beyond the cards' 2GB limit, but despite this, performance is not unduly affected at this level. With a Core i7 processor powering the proceedings (effectively removing the CPU as a bottleneck), we find that both cards are capable of exceeding the 30fps limit set by the console versions in terms of average and minimum frame-rates. The GTX 750 Ti is around eight per cent more capable here than its cheaper AMD equivalent, but the gameplay experience is much the same. However, it's really unlikely that gamers would pair a sub-£100 GPU with a £270 CPU, so we repeat the tests again, this time using a £90 Core i3 4130. The result? Minimum frame-rates drop on the AMD card, and there's noticeable stutter in built up areas, where the CPU is really put under load - check out the end of the video below to see the difference. At this point, it's no real secret that Nvidia's driver eats up less processor time than the AMD equivalent - something that's crucially important on lower-end PCs with less capable CPUs. This is important. AMD's Radeon R9 270X is an excellent card - almost 40 per cent more powerful in GTA 5 than the GTX 750 Ti in a quad-core system, and only a few pounds more expensive than the 750 Ti when it's on sale. However, on a dual-core Core i3 system, the stutter is extreme and minimum frame-rate isn't just lower than the GTX 750 Ti, it's lower than the R7 260X too. AMD makes some excellent hardware, but until the DX11 driver issue is resolved, we can only recommend Nvidia cards for PCs with lower-end CPUs. Nvidia also has another advantage: a truly effective way to cap frame-rates to 30fps. Frame-rate limiters are available that work on all GPUs, and GTA 5 even includes a half-rate v-sync option that should in theory act as a 30fps cap. However, none of these options guarantee a solid, consistent 30fps with even frame delivery - something that GTA 5 on console achieves with seeming ease. Nvidia's half-rate adaptive v-sync gets the job done, providing a locked 30fps with the 750 Ti. Both AMD's R7 260X and Nvidia's GTX 750 Ti can match the overall visual experience offered by the console versions of GTA 5, despite their 2GB VRAM limitation. AMD's R9 270X offers much more power for just a few pounds more, but driver issues cause real problems on less capable CPUs as you can see in the i3 metrics below. Click on the links above to buy these graphics cards from Amazon with free shipping. After completing our benchmarks, we went back to each enthusiast segment, specced out an appropriate gaming PC then tweaked settings to get the gameplay experience we wanted. In the case of our recommended entry level gaming PC (Core i3 processor with GTX 750 Ti), the console settings above still offer the best balance of image quality and performance, but there should be headroom available to improve on anisotropic filtering. For a mainstream gaming PC with a bit more power, we tested the Core i5 4690K (with no overclocking) in combination with our chosen GPU in this segment - the Radeon R9 280. We were hoping to run the game at 1080p with a locked 60fps at console settings. Hitting a consistent 60fps required some minor downgrades compared to the console versions, but we were able to boost presets in many more areas, particularly in terms of population density and variety. This is a superb GTA 5 experience, and a considerable upgrade over console overall. Just the inclusion of 16x anisotropic texture filtering on its own makes a big difference, but running at double frame-rate is clearly the biggest boost. Advanced Options: Long shadows, high resolution shadows, high detail streaming while flying. Moving onto the 1080p sweetspot cards in the sub-£200 category, we scale up our ambitions, moving all of GTA 5's standard graphics presets to the max - bar multi-sampling anti-aliasing. In the current market, Nvidia only has one offering here, the £150 GTX 960. That's pitted against three AMD competitors - the R9 285 and R9 280 (both in the £130 area) and the more capable R9 280X (£170). What's interesting here is that the GTX 960 and R9 285 are 2GB cards, while the 280 and 280X offer 3GB of VRAM. This is crucial as maxing out the standard settings sees the graphics RAM requirement shoot up to 2.6GB. 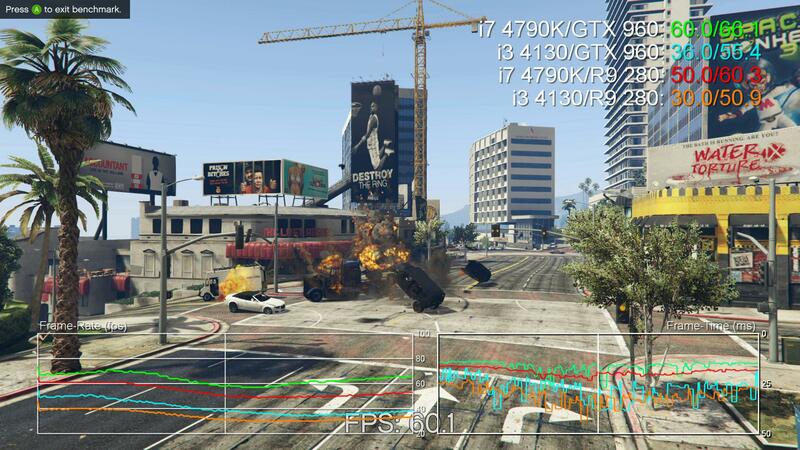 All of our benchmarks are carried out using the Core i7 4790K from here on out - and this screenshot shows you why: GTA 5 on our chosen quality presets requires a quad-core CPU for best performance. Marrying up a performance GPU with a less capable processor is not recommended on this game. Based on average frame-rates, the GTX 960 and the R9 280X are the clear winners, but there's only a nine per cent difference between the best and worst cards. Looking at the frame-times reveals that the 2GB cards have clear latency spikes owing to 'swapping' - the process where the game moves assets between VRAM and system memory. It is possible to dial back textures in order to hit everything snugly into 2GB, but this reduces asset quality below the Xbox One and PS4 standard - something we're loath to do with relatively expensive PC graphics hardware. Overall, we'd recommend the Radeon R9 280 in this price category. It's somewhat power-hungry compared to the frugal GTX 960, but it's competitive in terms of rendering power and that extra 1GB of onboard memory is proving increasingly important. It's worth pointing out that there are 4GB variants of the GTX 960 available, but at £200, the value proposition is questionable - you can get the much more powerful Radeon R9 290 for just £20 more, which also comes with 4GB of VRAM as standard. There are some cracking graphics card deals in the £150 range. It may not be the best performer, but AMD's R9 280 offers excellent value at £130-£140 - and has 3GB of onboard VRAM. Click on the links above to buy these graphics cards from Amazon from free shipping. Moving up to our final category - the high-end cards - we have five contenders. AMD has two 4GB GPUs available: the R9 290 and the R9 290X, while Nvidia's offerings are the GTX 970 and the GTX 980 (both 4GB cards, with caveats) and the mammoth 12GB Titan X. All of these cards are immensely powerful and to put them through their paces, we investigate GTA 5's advanced graphics menu, which includes additional features such as enhanced shadow and view distance options and improved streaming while flying. The additional processing load of these settings is frankly immense - you'll note that only the GTX 980 and Titan X match the average frame-rates achieved with the mainstream cards without the advanced options in effect. Minimum frame-rates are clearly impacted too. What's interesting is that the gap between frame-rates between 1080p and 1440p resolutions is relatively slight, suggesting that we may well be CPU or DX11 driver-limited. This is borne out by the lack of scaling found using Titan X, which achieves a paltry four per cent boost over GTX 980 at 1080p (! ), and a mere seven per cent boost at 1440p. These were crazy results we double and triple-checked to be sure, but the results remained consistent. Titan X's advantage rises to a comparatively massive 27 per cent at 4K, where we are clearly more GPU-bound. Part of this may well be down to our need to reduce advanced draw distance to 80 per cent - it's the only way to fit everything into 4GB of RAM at UHD resolution and may well free up some CPU resources in the process. We combined the GTX 970 with a Core i7 4790K, looking to achieve 60fps gameplay at 2560x1440 resolution. As it happens, the Core i5/R9 280 settings above scale up very nicely to the higher pixel count. If you have a 1080p monitor, you may consider using Nvidia's downscaling DSR technology at 1440p in order to achieve much-improved anti-aliasing. Alternatively, you can remain at native 1080p and push up the quality presets while still retaining that all-important 60fps. We're not quite maxed out on the standard menu, but we're getting very close - but the distance and shadow scaling options in the advanced graphics menu remain extremely intensive on resources and hit frame-rate hard (as the benchmarks demonstrate), so we recommend leaving those well alone. The Titan X is clearly the most capable card, but in a world where most gamers use 1080p or 1440p displays, the GTX 970 is the star of the show in terms of price vs performance. It's faster than both of AMD's cards, and not that much more expensive than the 290X (and at the time of writing, you get The Witcher 3 with it too). Concerns about the GTX 970's split-memory set-up aren't an issue in GTA 5 - frame-time analysis sees no additional stutter, not even at 4K, even when the full 4GB RAM allocation is used. Also curious is that both R9 290 and 290X offer virtually interchangeable performance, with differences mostly falling into the margin of error. Bearing in mind that the R9 290 has been seen on Amazon for as low as £216, that's an incredible amount of GPU power for the money, and the cheapest way to get an excellent 1440p60 experience in GTA 5. We've benched at 1080p for completion's sake, but certainly at these settings, the high-end GPUs are criminally under-used - 1440p should be the target here, with the Titan X set to 4K resolution. As we noted in the Digital Foundry Face-Off, Grand Theft Auto 5 on PC is the preferred version of the game, providing further refinements to an already impressive remaster. Optimised to run well across a wealth of PC hardware, matching the current-gen console experience is a doddle using modest PC components and while the advanced graphics options aren't exactly game-changing, there are a couple of key features in there that will test the limits of PC hardware for years to come. On reflection, what impresses us most about the game is its ability to hit 60fps with ease on relatively inexpensive hardware - the required Core i5 processor is already a favourite for enthusiast PC gamers and you shouldn't need an overclockable example to get good performance. While we favour the Radeon R9 280 as the GPU of choice in the £150 category, hitting 60fps should be easily achievable on a wealth of cards old and new - Nvidia's GTX 670 is a second-hand steal these days at around £70 and features similar performance (albeit with a 2GB VRAM limit). Just one word of warning though - as we noted in the Face-Off, GTA 5 on PC does seem to have minor stutter issues at 60fps with v-sync enabled. If you encounter this during gameplay, you should be able to smooth out the experience by using the hardware v-sync option in your GPU control panel instead. It's a small tweak, but it can make a big difference to the fluidity and consistency of what is a pretty remarkable PC game. And filming is already underway.